Goodreads says, "Sixteen-year-old Aza never intended to pursue the mystery of fugitive billionaire Russell Pickett, but there’s a hundred-thousand-dollar reward at stake and her Best and Most Fearless Friend, Daisy, is eager to investigate. So together, they navigate the short distance and broad divides that separate them from Russell Pickett’s son, Davis. Aza is trying. She is trying to be a good daughter, a good friend, a good student, and maybe even a good detective, while also living within the ever-tightening spiral of her own thoughts. In his long-awaited return, John Green, the acclaimed, award-winning author of Looking for Alaska and The Fault in Our Stars, shares Aza’s story with shattering, unflinching clarity in this brilliant novel of love, resilience, and the power of lifelong friendship." Aza Holmes battles her demons everyday and often times finds her thoughts spiraling and taking over her mind. Her childhood friend's father (who happens to be a billionaire), goes missing and there is a reward for anyone who can locate his whereabouts. Aza, and her charismatic best friend Daisy, decide to try to find her childhood friend, Davis, and try to earn the reward. But Aza suffers from anxiety and can be filled with worry. Throughout the story her issues will ultimately hold her back. With a push from Daisy, she contacts Davis, hoping they will be able to find his father and get the $100,000 reward, but they come to find that his father disappeared during fraud investigations. On the bright side, there are sparks between Davis and Aza, but will Aza allow herself to open up and more importantly will they find Davis's father? 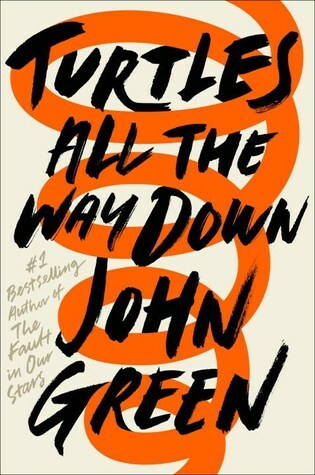 John Green's Turtles All the Way Down is such a smart read that his fans will truly appreciate. Aza is such a great character and very similar to Green's previous characters. She's smart, engages in witty dialogue, thoughtful, and worries more often than not. What sets Aza apart from Green's other characters is her battle with anxiety and her overpowering thoughts. In Turtles All the Way Down readers are privy to Aza's worries and her obsessive thoughts on infection, life, and just about everything. I didn't think I'd be able to identify with Aza in the very least, but surprisingly, I could. I mean haven't we all irrationally worried in our lives? I know I have and I could appreciate Aza's struggle. I think many teenagers will be able to identify with her as well and I wish more characters were like this in young adult literature. She felt very real and very authentic. The mystery of where Davis's father didn't really compel me to continue reading as much as the character development in Turtles All the Way Down. John Green is just so darn good at creating such smart, quirky characters that you truly care about. I loved the friendship between Daisy and Aza, their conversations, and Daisy's Star Wars fan fiction. Things aren't always easy between the two girls, but I enjoyed their friendship. I also appreciated the budding relationship between Davis and Aza and how they reconnected. They both have dealt with a lot in life. Turtles All the Way Down is one of the smartest YA reads that I've encountered in quite sometime. It's about so much more than finding Davis's father or Aza and Daisy, but rather an examination of mental illness and how it impacts teenagers today. It's about friendship, learning to accept shortcomings, and tackling our down demons head on. While it wasn't my favorite of Green's novels, I still thoroughly enjoyed it and will read anything John Green writes. Great review! I really liked this book, but I think I still like TFIOS more. Me too. I LOVED TFIOS....not much can compare to that one! Thanks for visiting AJ! I still haven't read this though I want to. I am just worried it won't live up to my expectations. TFIOS is one of my favorites and set the bar pretty high. Fantastic review! It wasn't as good as TFIOS, but it was still a very well written story. I think you'd enjoy it overall, Christina. Thanks for visiting!